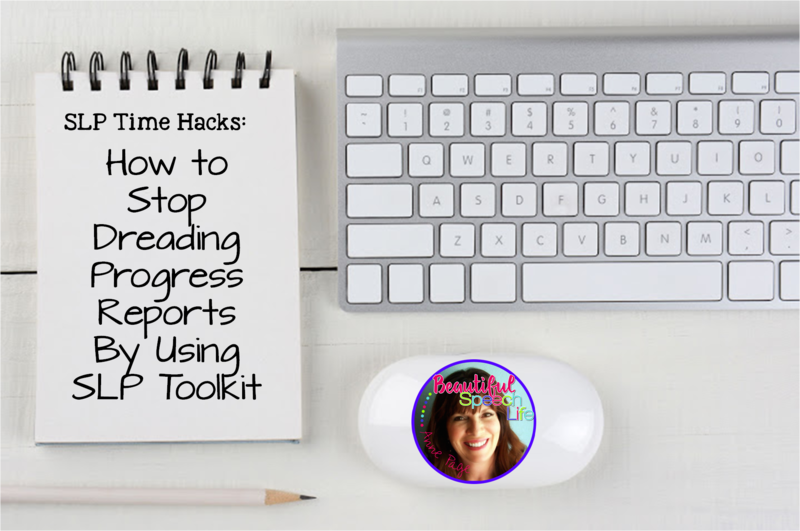 Last week in” SLP Time Hacks: Streamlining Progress Reports Dream or Reality?”, I talked about SLP Toolkit, a web based software program that was created by two speech language pathologists. Lisa Kathman and Sarah Bevier. In case you missed it, click here. You can use SLP Toolkit to screen, baseline test, progress monitor, and write goals for students. Last week I tested it out specifically for progress monitoring. I have to tell you, I love it! First I set up my caseload, which was really easy and didn’t take too long at all. Just input student’s name, IEP date, evaluation date, case manager, teacher and grade. A really helpful feature is the ability to sort by any of the fields. For example, I like to write my progress reports by grade level. I can just click on Grade and oila! my caseload is organized by grade level. This makes my list-building organized SLP heart very happy. The progress monitoring feature has a speech sound production area which includes articulation (with all sounds) and a phonological process area. Other areas include subheadings of cognitive, social language, expressive receptive language, fluency, and voice/resonance. A screen comes up with a list of 10 word pairs, I ask student to tell me one way the words are alike and one that they are different. I click thumbs up or flag. I am taken back to the progress monitoring screen where the score is shown. The screen is user-friendly with a sidebar for the menu and features are easy to click. Although I haven’t used the social language feature yet, it looks really interesting and there are many rubrics. What I like is that the rubrics are “clickable”. You click on the area that fits the student’s current level of competence and the score is placed in the bar at the bottom of the screen. Also the correct description is included with the score ready to be copied and pasted into your progress report. The progress monitoring tool is leveled (which is awesome). The stimulus items chosen for each of the different levels were selected considering a combination of research, academic standards, grade band Tier 2 vocabulary, and developmental milestones. So important to me to know that all of these items were taken into consideration. The levels are: Level 0-preschool, Level 1-kindergarten, Level 2-grades one and two, Level 3-grades three through five, Level 4-grades six through eight and Level five-grades nine through 12. I’m not going to walk you through this step-by-step because SLP Toolkit has several tutorials that do a great job of that. I’ll put a link at the end of this post for you. I do want to highlight what I like most about using SLP Toolkit for my progress reports. 1. It’s really easy. No shuffling papers and digging for data sheets. Everything I need is on my computer screen. (And it syncs across devices, so I can use my iPad too). 2. It’s user-friendly and easy to navigate. 3. I’m using new materials that the student isn’t used to, so I can see if the skill is carrying over across different materials and situations. 4. I like that I can click on the student’s name, see the goals at a glance, select the progress monitoring tool I want and then go. It’s very time efficient. Depending on the number of goals a student has, the whole process is quick. I’d say 15-20 minutes per student. 5. As I said earlier, I am really happy with the fact that it is leveled and that the leveling is based on research and standards. 6. It’s affordable. $19 a month (or $180 annually) to not only keep myself organized and efficiently monitor progress but to write goals, keep a goal bank and baseline test is a bargain. 7. When it is time to do the next round of progress reports, I will be able to compare them side by side with the progress monitoring I just completed to view progress across time. I love that feature. The whole process was so smooth and stress free for me compared to my old way of doing things. I really am kind of looking forward to doing my progress reports next time, so I can compare them to the ones I just did. I’m also looking forward to having a goal bank at my fingertips and to using the present level assessments. My recommendation to you is to check it out. Click on this link where you can get a free trial for up to five students. Do a little test drive, look at all the awesome features. I really think you will be as impressed as I am. Disclaimer: I did receive a no-cost six month subscription of SLP Toolkit, so I could review it and give feedback. All of the opinions expressed are strictly my own. Did you like this post? If you did please let me know in the comments below. Make sure to join my email list for more posts like this and for a monthly free therapy product. No more dreading progress reports! P.S. Here is a link to the progress monitoring tutorial. Click here for an article in the The Asha Leader Blog that Lisa Kathman and Sarah Bevier from SLP Toolkit wrote on Why Use Rubrics to Measure Communication Goals? I also LOvE SLP Toolkit and am using it every day for someone! How did we live without it Judy?